Apologies for the bad pictures of a beautiful paper! This couple lost their home in Kingwood (northeast Houston) to the flooding from Hurricane Harvey. They relocated to a new-but-smaller spec house in Somerset Green near central Houston, and are using interior designer Anthony Stransky of L Design Group to decorate their new home, while giving their traditional taste a tad more modern feel. 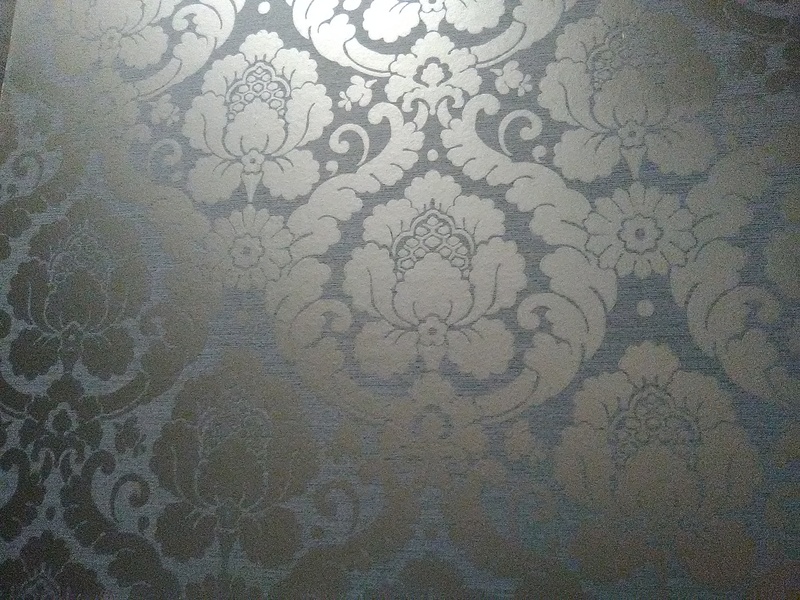 Damask wallpaper patterns are quite traditional, but the large scale and metallic sheen of this particular selection bring it into the modern age. And the over-sized pattern fills the walls nicely, in this sizeable powder room with 10′ high ceilings. 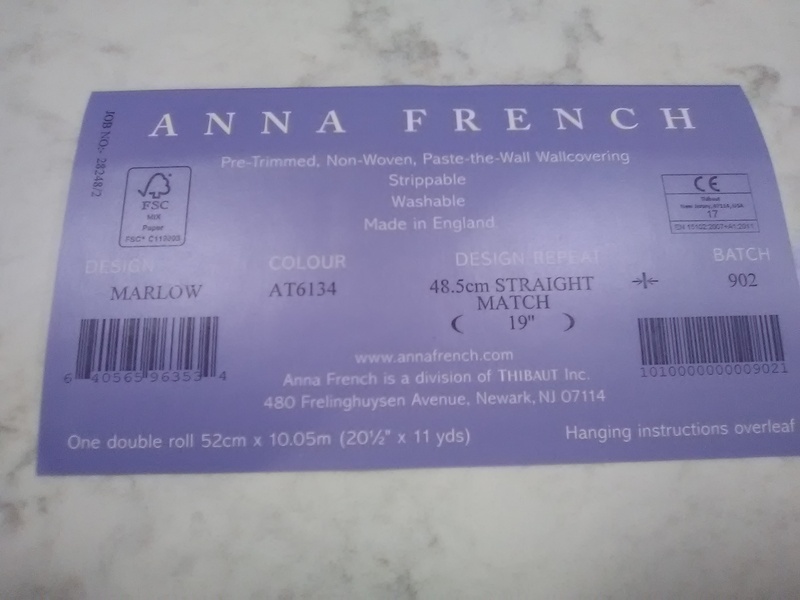 The pattern is in the Anna French collection by Thibaut Designs. It is printed on a thickish non-woven material. I usually prefer thin papers, but this was quite nice to work with. It didn’t crease like many N-W papers do, the seams were practically invisible, and, once pasted and softened, it was flexible and stretchable enough to accommodate some pretty un-straight and un-plumb walls. This non-woven paper could have been hung using the paste-the-wall method. But I prefer the pliability that comes when the material itself is pasted. 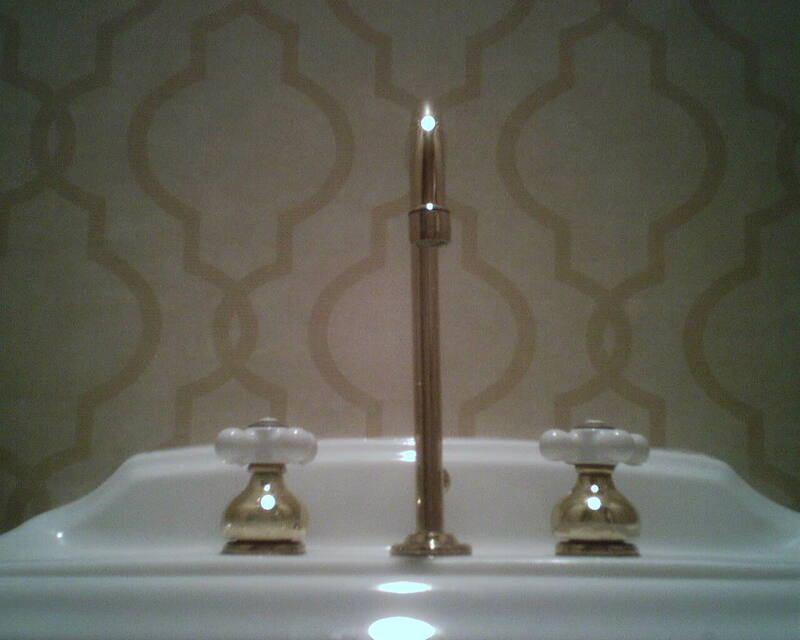 Plus, pasting the material definitely makes it easier when working around pedestal sinks and behind toilets. 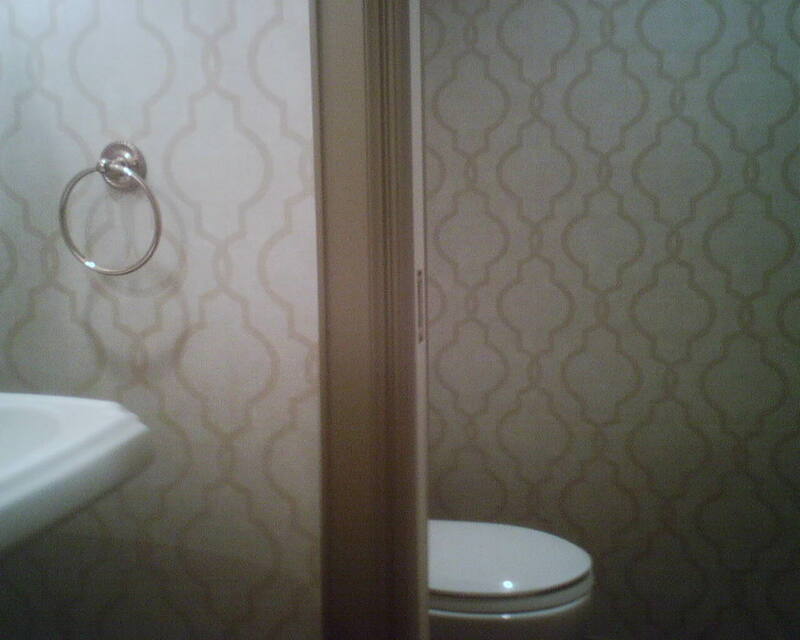 The builder coated the walls of this large powder room with a bland dark tan paint. 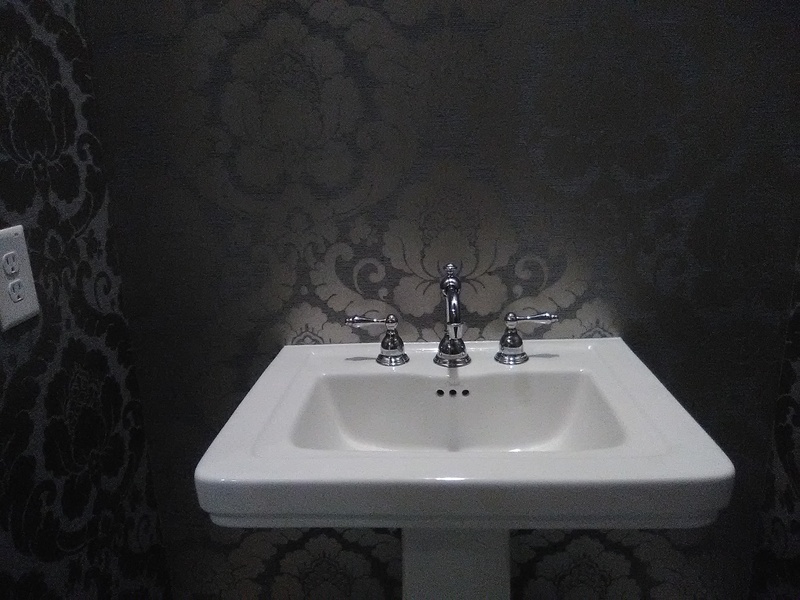 These homeowners had never used wallpaper before, but, once they went for the interior design team’s suggestion, there was no learning curve – They LOVE the newly papered powder room! Anthony Stransky and founder Neal Leboeuf of L Design Group serve the entire Houston metropolitan area. They assist homeowners with interior design, new home buyers with all choices such as flooring, faucets, window coverings, fixtures, etc., and – when they get breathing room – they do events planning. Super guys, energetic and fun, with a look that’s modern and fun, with an urban edge. See them in a summer 2018 issue of Houston House & Home magazine – on the cover and in a story inside. 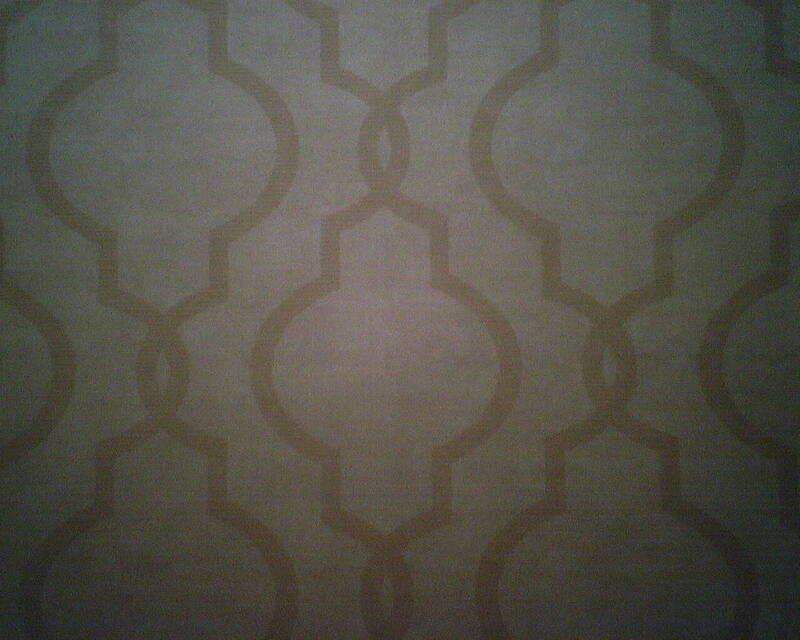 A gal with a big personality and a love of glam needs a wallpaper that follows suit. This one does the trick! 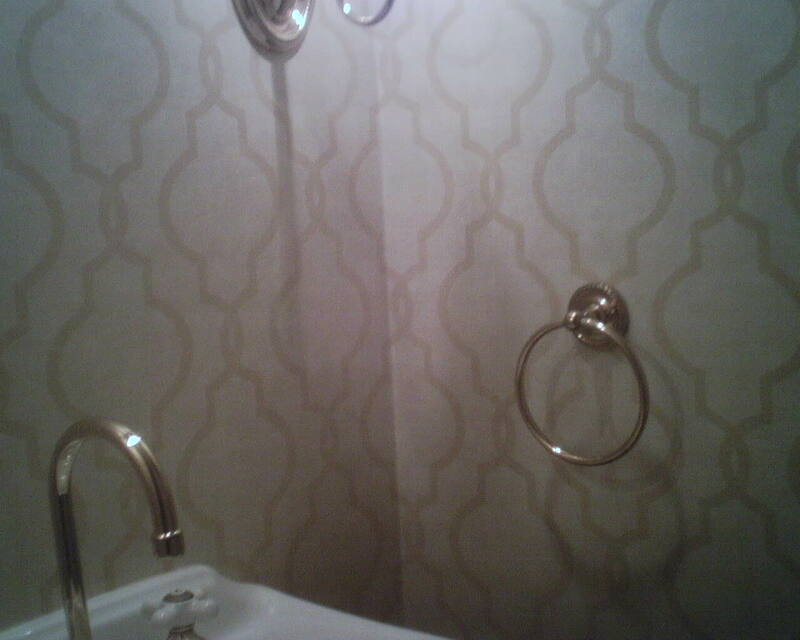 This large damask pattern has a traditional feel, but the sparkly accents bring it into the new millennium. I like the glittery look on this paper much better than the glass bead products that have had some popularity recently… The real glass beads – which are fairly pricy – simply don’t sparkle unless the light is hitting them just the right way. And they make the wall bulky, especially in corners, they fall off and create bumps behind the paper, and clog drains and get into the waterways. This paper has much more sparkle, no matter where the light is coming from, and it’s much more economical, too. And it was a dream to work with. All good things. 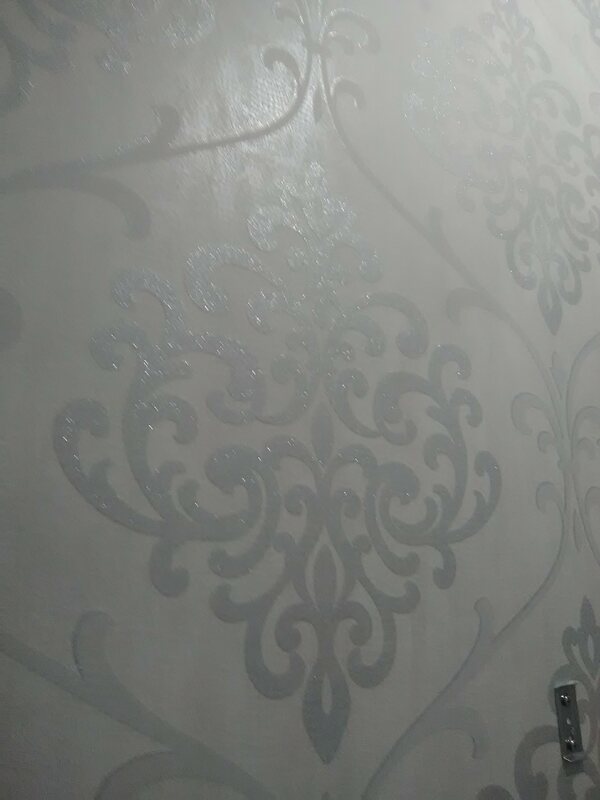 The photos don’t show the sparkle very well, but trust me, the room looks glittery, glitzy, shimmery, glamorous, and fab! 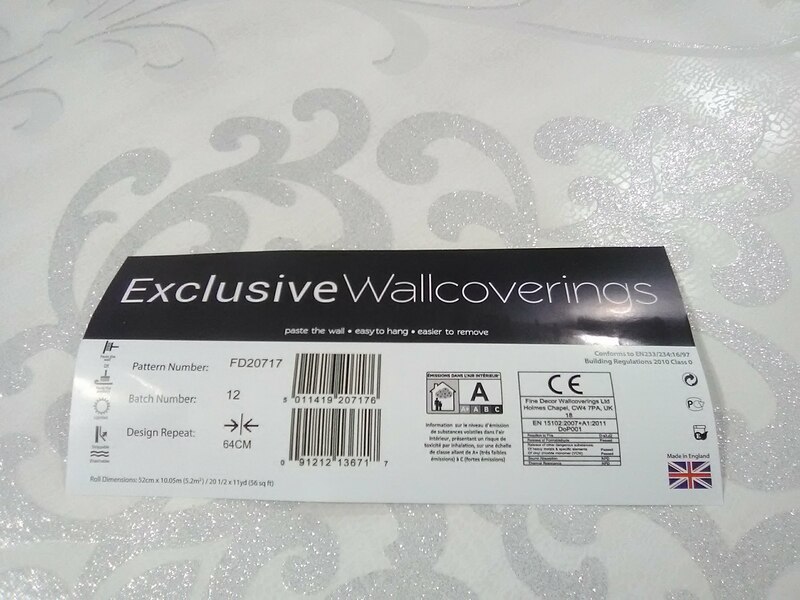 This wallpaper pattern is by Exclusive Wallcoverings. It is a non-woven material, and can be hung by either the paste-the-product or paste-the-wall method. I hung it in a powder room in a brand new home in central Houston. It was bought at below retail price from Dorota Hartwig at Southwestern Paint on Bissonnet near Kirby. (713) 520-6262 or dorotasouthwestern@hotmail.com. She is great at helping you find just the perfect paper! Discuss your project and make an appointment before heading over to see her. This 1958 ranch-style home overlooking the jogging trail along Braes Bayou in central Houston has a strong Colonial flavor, and that is reiterated by the collection of antique furniture and accessories. 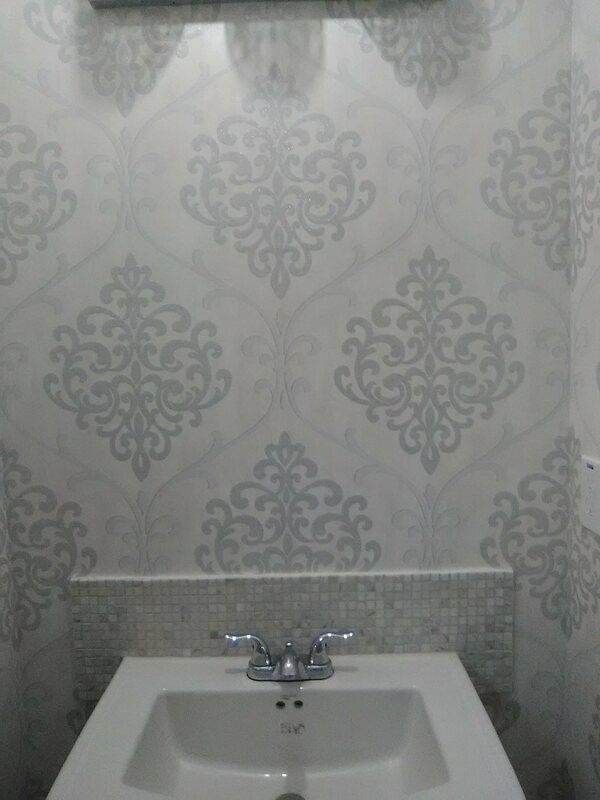 In the powder room, the previous sweet tan-on-cream toile wallpaper pattern fit in perfectly. 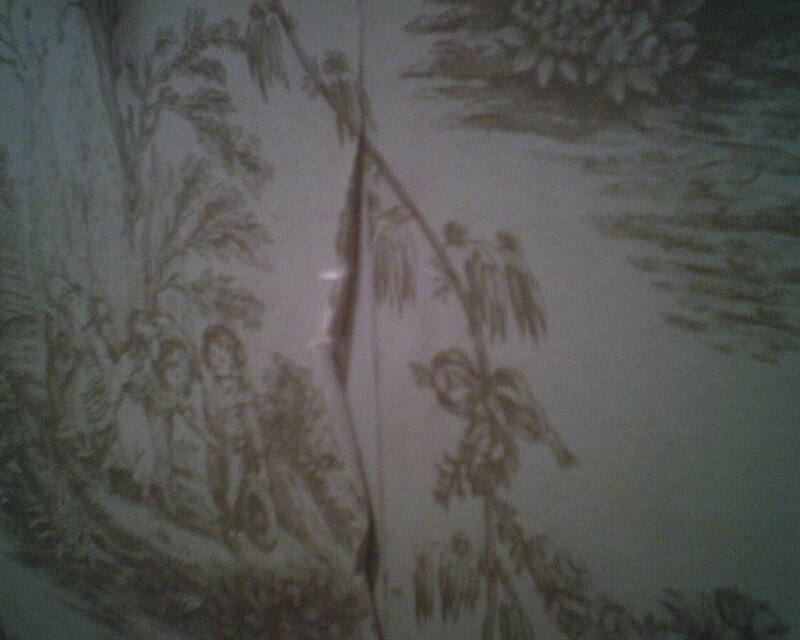 But, over years of raising kids and careless splashing of water onto the wallpaper, some of the seams were curling (see first photo and my previous post). And, come late 2016, the homeowner was ready to update the home and bring in a more modern feel. But she didn’t want to fight the bones of the house. She shopped at my favorite store (see below) and found the perfect pattern! A trellis is a classic design, dating back hundreds of years. But this version edges toward a contemporary feel. And the color is perfect with the unique shade of the woodwork. I engineered the room so that the trellis pattern would be centered on the sink / faucet, and so it would look nicely balanced around the mirror and light sconces (4th photo). The homeowner was ecstatic. She kept saying that it looked even better than she hoped it would. 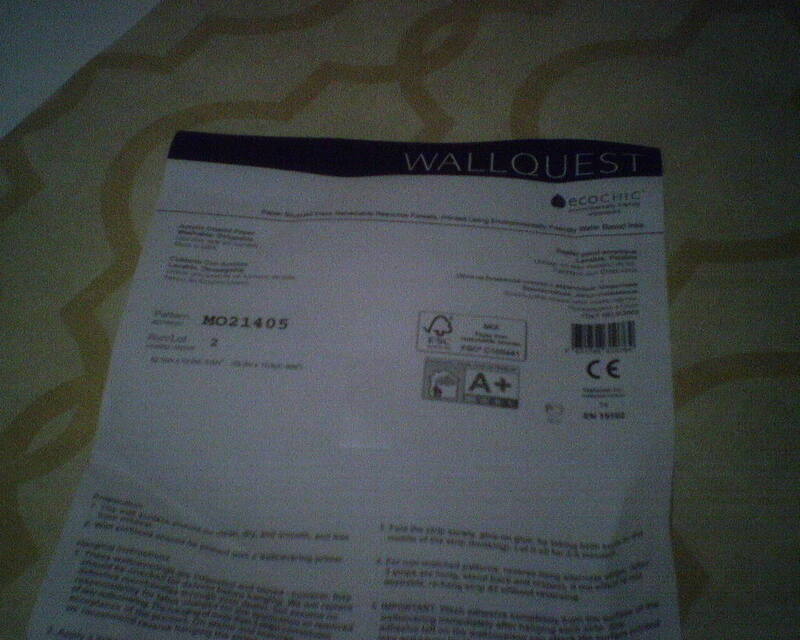 This wallpaper is by Wallquest, in their EcoChic line. I like this brand a lot. This paper was bought at a discounted price from Dorota Hartwig at Southwestern Paint on Bissonnet near Kirby. (713) 520-6262 or dorotasouthwestern@hotmail.com. She is great at helping you find just the perfect paper! Discuss your project and make an appointment before heading over to see her.